I bought Sukin Organics Purifying Shampoo sometime last year because I wanted to try a Sodium Lauryl Sulfate(SLS) free shampoo for my sensitive scalp. 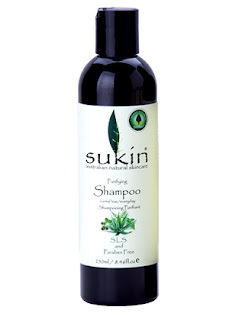 Sukin Organics is an Australian organic skincare brand. Finally finished it so here's my review for it. When poured, it is just this yellowish liquidy form that's not thick at all. You can tell it's going to be a lightweight shampoo with no chemicals in it. It has a pleasant smell but there's this citrusy tangerine/mandarin orange smell that really stood out (I wasn't a fan of it at first) so if you are not a fan of tangerine/mandarin orange, you might want to skip it. The shampoo is really hard to lather since it lacks all the SLS. You just have to wash it as per normal and try to let it not bother you. It takes time trying to get used to a foamless shampoo since people just assume that if it lathers well, it cleans better. I still have mixed thoughts about it after using it all this while. As a shampoo for sensitive scalps, it does a good job. It does not irritate my scalp at all. My hair felt soft and nice after washing. As a shampoo for oily scalp (which I do have), I feel it doesn't cleanse well enough. I do use hair products (hair wax, sprays etc) and if I use only this Sukin shampoo to wash my scalp and hair, I feel that the spray/wax and dandruff don't really come off as easily. Another thing I dislike about is how the hair turned out. The hair does feel very soft and light on good hair days. But on bad hair days, it turned limp (so soft it fell flat). I couldn't figure out this bit but maybe this is the hair-softening effect it was to give which apparently I never took notice. As I didn't buy the Sukin Nourishing Conditioner to use with it, I can't really tell whether it would have turned out better if I did use the conditioner. But based on reviews I've read, the conditioner seems to be better than the shampoo and helps to condition the hair well. Overall, Sukin Organics Purifying Shampoo does work better as a gentle shampoo which you would want to use daily, but probably not so if you want to use it after a long day to remove grime and dirt from the hair. I think it's a decent shampoo to pair with a strong anti-dandruff shampoo (assuming you have oily scalp) and you can then alternate between the two since the anti-dandruff shampoo does overstrip oil from the hair and scalp and this doesn't. I'm still undecided whether I liked this or not. I might give it another go since I've having a bad time with my sensitive scalp after switching up to another shampoo. I probably get this again, this time with the conditioner. The shampoo comes in 250ml/500ml/1 litre bottles. Retails at Watsons Singapore for SGD $12+(250ml), SGD $19+(500ml), SGD $29+(1 litre). I pretty much agree with your comments. It is a bit strange using a shampoo that doesn't lather but I liked the conditioner. My hair feels no worse that when I wash it with 'conventional shampoos' although if I had used a lot of product I don't think it would wash it out very well. A good everyday product though. I didn't like this shampoo much and dumped it in favour of Human Nature strengthening shampoo. It was quite strong, a bit drying too and did a poor job in lathering. My hair always went flat. In contrast, my current shampoo lathers well and my scalp is much healthier now, though my dandruff is still around.